Trendsetter: A leader of the pack, someone who everyone else follows. So now if I term the Triumph Speed Triple as a trendsetter I wouldn’t be wrong because if we go a little back into the history of motorcycles, it was the first modern sport bike or race replica motorcycle without the aerodynamic plastic fairing or as we call it “Streetfighter” in the motorcycling category. Way back in 1994, the first Triumph Speed Triple was introduced on the basis of the Triumph’s Triple Series Modular Engines. However in late 2016, Triumph made exactly 104 changes to the Speed Triple. Five ride modes, ride by wire & switchable ABS were few important noticeable changes. Engine: With power of 126.7 hp @ 9301rpm & 104.82 Nm of torque @ 7797 rpm, the numbers might not do justice to the motorcycle but still it’s a bold statement that the bike makes. Below 3500 rpm it is a law abiding motorcycle but once you cross that, it just dances to the tune of the 1050 cc triple cylinder engine to achieve those illegal triple digit speeds. 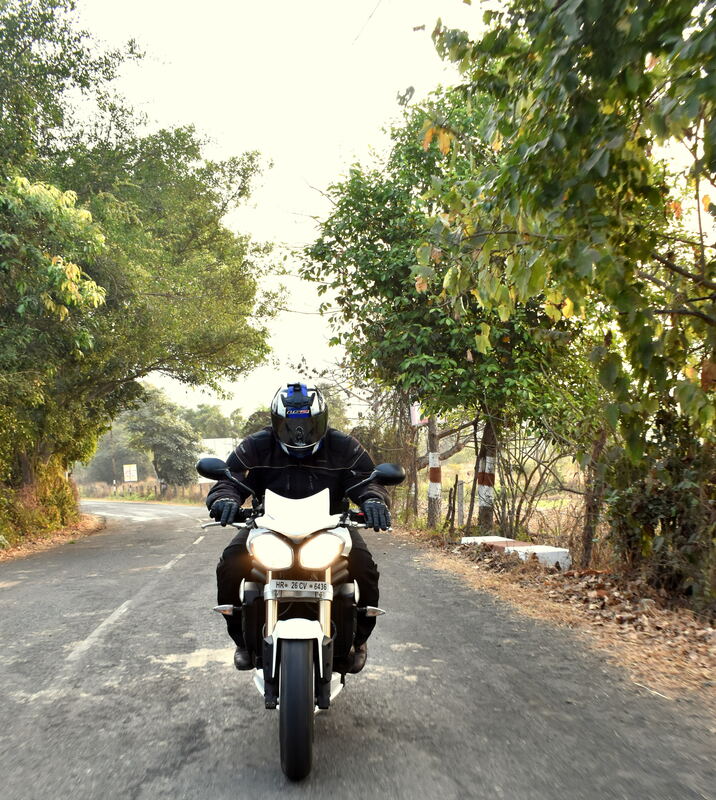 The exhaust does help to set the tone right & with the six speed gear box offering easy shifting, a combination of both makes life more symphonically easier for the rider. Ride Quality: Though I really wish that the clutch should have been much little lighter to make life easier in city traffic but at the end of the day it doesn’t forget it’s a liter class bike & so it has enough power & torque to give you those wet dreams of triple digit speeds. To support that Speed Triple comes equipped with 320 mm floating twin discs at the front & a single 255 mm disc at the rear which unfortunately doesn’t gives enough confidence to stop this monster. 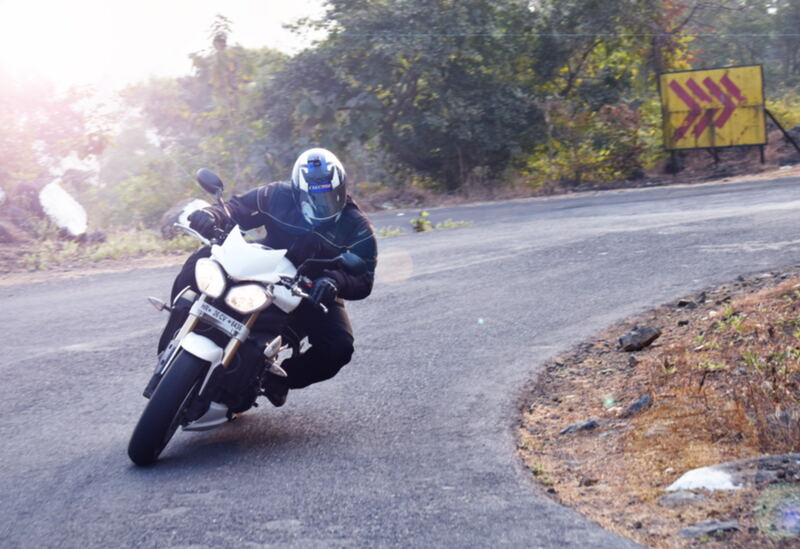 Build Quality: Triumph’s legacy & product quality is unquestionable & the build of the speed triple is an example of it. Gorgeous paint, beautiful attention to detail and a whole host of different textures, colors and finishes makes the motorcycle a real proud bike. The switchgear, instrument cluster quality is all topnotch & what adds as icing on the cake are those blue shift lights lighting up the system every time you touch the red line. Value for Money: While the 2017 Speed Triple is already on sale in international market, in India we have to wait a little more to finally lay hands on the same. For INR 11.5 lac (exshowroom Delhi) today we have loads of option like the Suzuki GSX S-1000 for INR 14.55 or the Kawasaki Z 1000 for INR 14.25 lac but soon we expect the 2017 Speed Triple to hit the market & then we will be able to comment more openly on the other options.